They were dubbed the "Legueu cocktails". 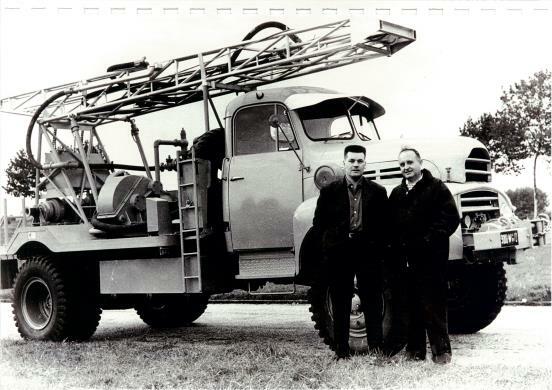 For example, the TH4 (Trucks, Hotchkiss 4×4) was launched in 1954 equipped with a Ford axle, a Citroën cab and a Hotchkiss Lago engine developing 170 hp. ALM produced small series adapted to the needs of its customers (oil prospecting in the desert, fire-fighting, public works etc.). In 1959, ALM began to construct certain components: transfer boxes, chassis, axles, cabs, and designed its own vehicle, the TPK4 which was a precursor to the VCOM and VLRA. ALM made a name for itself in the market by observing a fundamental principle pronounced by its founder: "Any improvement must always be able to be retrofitted to a truck of the marque, whatever its age". Magazine : Charge utile magazine, n°67, 2012. Book : Jean-Gabriel Jeudy, Trucks of France, the first age, Massin éditeur, 1993.